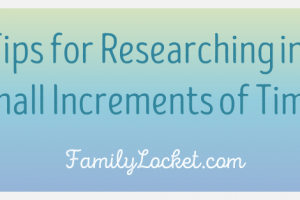 Do you wish you had more time to devote to your genealogical research or family history projects? Do you ever sit down to your computer and after an hour wonder what you’ve accomplished? I’ve found that most people feel time crunched and struggle with feeling productive in their family history efforts. 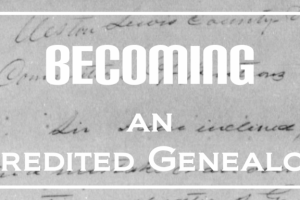 When I set the goal to become an accredited genealogist I wondered how I could possibly get everything done. This year I’ve worked hard to develop several strategies to streamline my efforts and today I’m going to share how I make the most of my time. 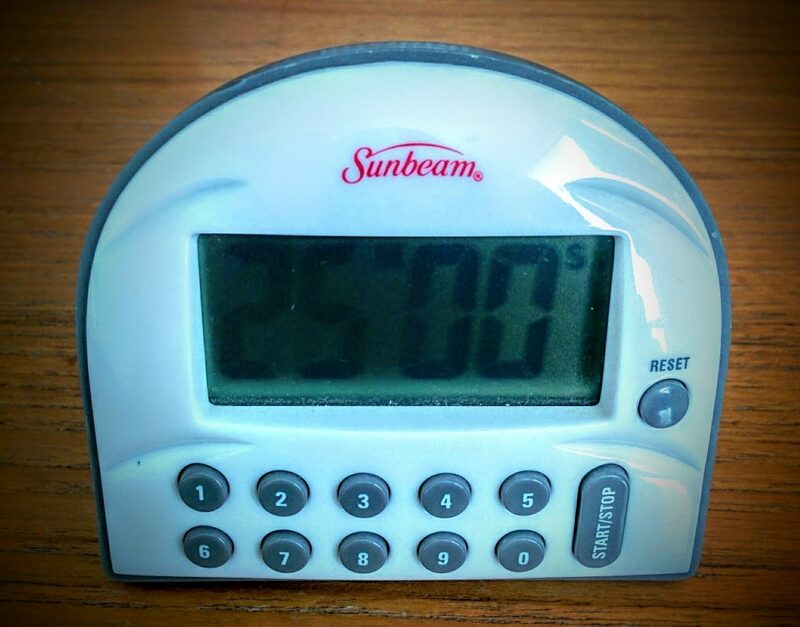 A few weeks ago Amy Johnson Crow wrote a blog post titled “Avoiding Distractions in Our Genealogy” where she discussed the power of setting a timer for twenty-five minutes then taking a five minute break. I was intrigued with this idea and decided to give it a try. After a solid month of trying this trick, titled The Pomodoro Technique, I’m ready to weigh in. In a nutshell, I love it! I set my intention for those twenty-five minutes and go to work. Glancing up every so often to see how much time I have left motivates me to focus and get the job done. I structure all of my genealogy work in twenty-five minute blocks. When the timer goes off, I stand up, get some water, walk outside to get the mail, or do some yoga to stretch out. Those five minute breaks give me a chance to refocus and come back to my computer recharged. I do a longer break of at least 30 minutes every two hours or so. Why does this work for genealogy? We tend to become distracted from our initial objective. We chase after the next hint on Ancestry or start looking at photos on FamilySearch and before we know it an hour has gone by and we didn’t finish what we set out to do. If we feel like we’re not accomplishing enough, maybe we need to take a look at where our computer time is going and get it under control. I’ve been keeping a research notebook for over 13 years. Each day I write the date and my specific plan for the day. 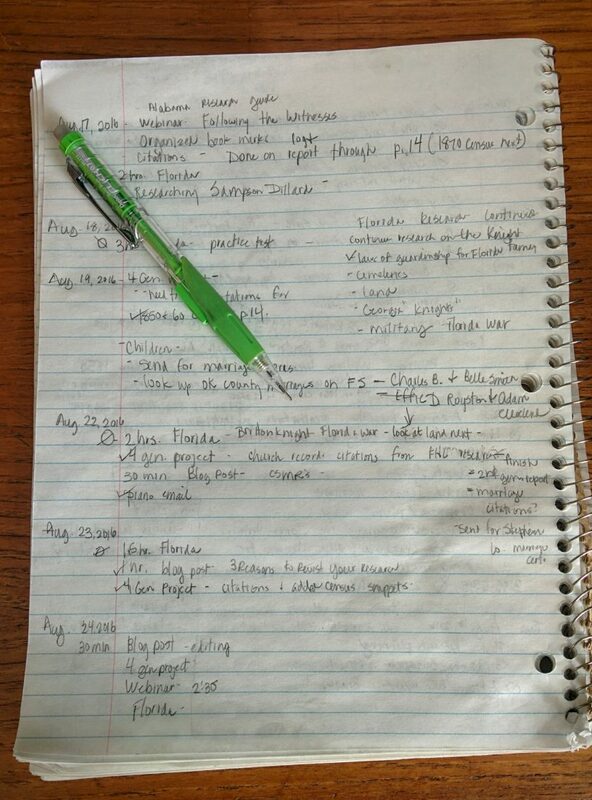 For example, on August 23, 2016, my plan was to research in Florida for 1.5 hours, spend an hour writing a blog post, and work on citations for my Four Generation report. I checked off each item, a small goal that worked towards a larger goal. I didn’t have to write an entire blog post that day, just work on it for an hour. I didn’t have to do all eighty hours of the Florida research I need for Accreditation, only 1.5 hours. Having specific intentions keeps me on task and helps me make progress. When a task is completed, it gets checked off. Anything that doesn’t get done can be moved to the next day. If I’m researching online and suddenly see a whole new avenue of research to pursue, I write that down then continue with my twenty-five minute intention. At my break, I can add it to my list for the day or add it to my list of long term to goals. In order to work towards my long term goal of accreditation, I’ve had to break that goal into several short term goals. I use Evernote to keep track of my goals and love the checkbox feature that enables me to mark something as done. Your family history and genealogy goals will be different than mine, so take time today to decide what you’d like to accomplish both long and short term. Create a spreadsheet, a note, or a document that you can refer to each time you work on your family history. Break up those large projects into manageable segments, then give yourself a timetable to finish. Be flexible and adjust your goals as needed. I originally set a goal to submit my Four Generation project for Accreditation on July 1st. Writing my first generation and citing my sources took much longer than I thought, so I moved my submission date to October 1st. 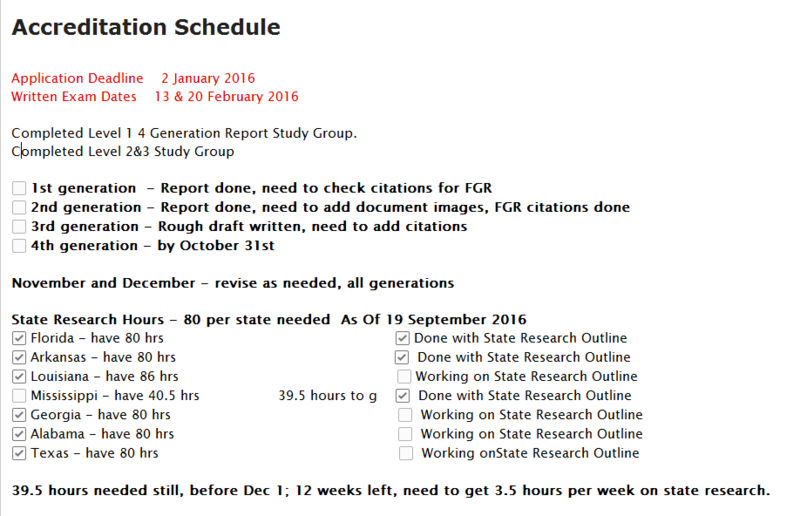 I’m working on my third generation now, but not ready to submit yet, so I’ve moved my goal to January. Life happens and we have family, jobs, and other things to attend to. It’s okay to make changes! 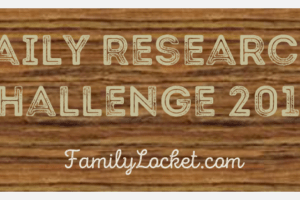 What family history or genealogy goals do you have? Writing the history of your grandmother? Researching a brick wall? Learning to use a new software program? Digitizing your photo collection? Write them all down and break them into smaller pieces. What’s the use of setting your goals if you don’t figure out how to accomplish them? 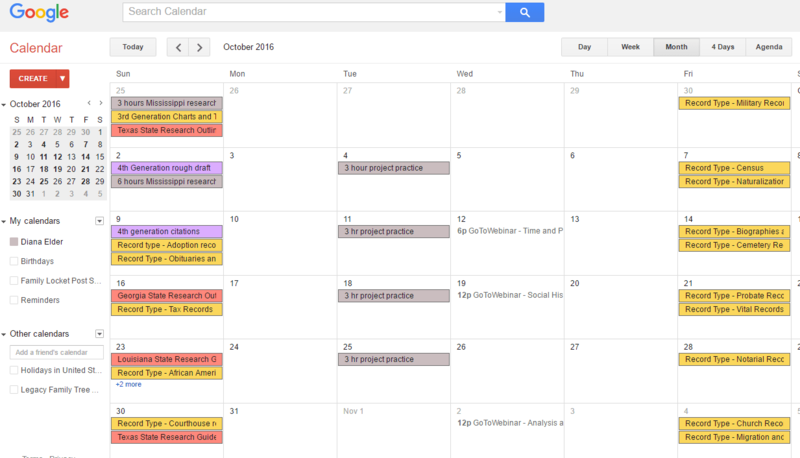 I use Google Calendar to schedule my goals. I plan blog posts a few weeks out, have weekly milestones to meet for Accreditation, and schedule family history projects. I give myself leeway to change things around, but having a plan helps me not feel overwhelmed. I work best when I have flexibility built in, so I’ll set a goal to do three hours of Mississippi research, take a look at my week and decide how to fit it in. I put my Accreditation goals on Sunday, but I know I actually have all week to work on those goals. I work best if I’m enjoying my task. If I’m burned out of looking at the computer screen, I take a break and go through some paper files. I work on Tom Jones’s Mastering Genealogical Proof. I watch a webinar. I listen to a podcast. Filling my genealogical bucket reaps huge rewards. How has this been working for me? Great! I still occasionally feel overwhelmed with the sheer magnitude of all that I need to accomplish, but thanks to all of these tools, I am slowly but surely making progress. What productivity tools do you use? Best of luck in your family history endeavors!